Target has always been a popular place to go to and shop during the holiday season and with that, this year, they are doing something very cool with their iOS app that involves iOS 12 and its cool AR features and capabilities. 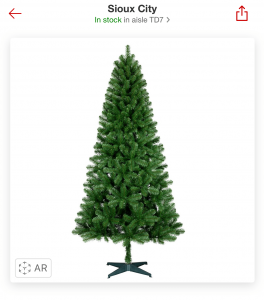 When searching for a Christmas tree to get for your home, you can use the AR features to view a Christmas tree in the app, select a spot in your home where you are going to have it stand, and then see how tall it would look in your home. This makes it so that if it were to be too big, you can find a tree that is smaller or vice versa. In order to use this, your iPhone must have iOS 12 downloaded and installed, and you must be using the official Target app in order to use this feature. To find and use this feature, simply find a Christmas tree in the Target app and then in the bottom-left corner of the image, there should be the Apple AR logo and then have the “AR” acronym right next to it. From there, you should be able to put the tree in the room or area you want it in. This feature is similar to the one that IKEA has in their app, where it allows customers and users of the app to be able to test out furniture in their home and enable them to see how the furniture would look and fit. It is currently unknown whether or not this works on the iPad since Target did get rid of the iPad version of their app. However, if you want to comment down below and tell us whether or not it works on the iPad, we would feature that information in this story. As always, you can order Christmas trees from their app and pay with Apple Pay as one of the various payment methods the app allows.